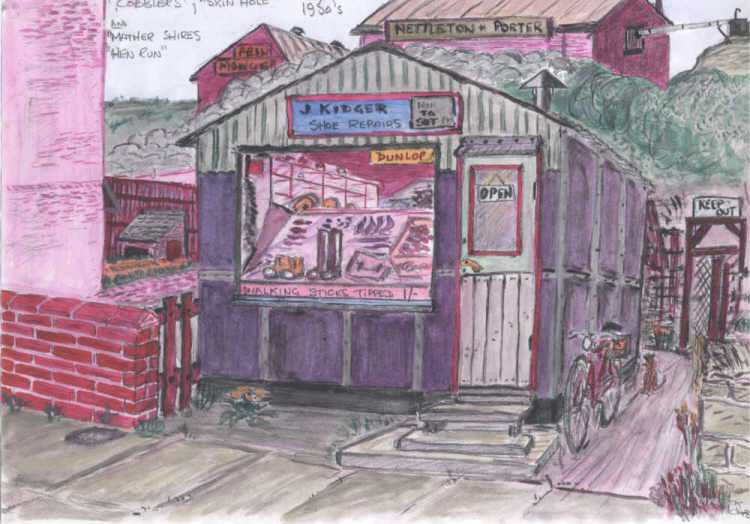 John Kidger started his shoe repair shop in Flushdyke after leaving the Forces in the 1940s. He was renowned locally for his skills and his cobbling was immaculate. In the 1970s, he moved house and his business premises to Streetside, near the Flying Horse public house. Behind Kidger's shop was the hen run of one Mathew Shires, one of many that he rented in various parts of Flushdyke over the years. Behind the hen run is the old pit hill and the "skin 'oil' or fellmongers of Nettleton and Porters. The smell from here in summer was legendary. A fellmonger is someone who removes hair from animal hides in preparation for tanning. The process of fellmongering used to be done manually but had to be done quickly after the animal was slaughtered to prevent the hides from decaying before tanning could begin. Nevertheless, there was always the smell of decaying flesh and it could be quite unpleasant for the people unfortunate to live close to the fellmongery. The house on the left is part of Camber Terrace.